There are 50 Assisted Living Facilities in the Palm Bay area, with 26 in Palm Bay and 24 nearby. The average cost of assisted living in Palm Bay is $2,826 per month. This is lower than the national median of $3,346. Cheaper nearby regions include West Melbourne with an average starting cost of $2,750. To help you with your search, browse the 269 reviews below for assisted living facilities in Palm Bay. On average, consumers rate assisted living in Palm Bay 4.0 out of 5 stars. Better rated regions include West Melbourne with an average rating of 4.2 out of 5 stars. Caring.com has helped 5 families in Palm Bay find high-quality senior care. To speak with one of our Family Advisors about assisted living options and costs in Palm Bay, call (855) 863-8283. Located a bit south of Cocoa Beach on the east coast of Florida, Palm Bay lures nature lovers with attractions like Indian River Lagoon and Turkey Creek Sanctuary. Palm Bay is also home to 26 assisted living facilities for seniors who need some help with activities of daily living like dressing, personal hygiene and eating, while supporting an independent and active lifestyle. There are several types of assisted living facilities in Florida licensed based on the standard of care they provide. Although its crime rates are just slightly above the state and national averages, Palm Bay is a relatively safe city with 4.69 violent crimes per 1,000 residents per year. The national average is 4 violent crimes per 1,000 residents per year. Brevard County has programs like Senior TranServe and Vets Driving Vets that can assist seniors with transportation for errands like medical appointments, family visits and grocery shopping. The cost of living in Palm Bay is nine percent lower than the national average which should help seniors on tight budgets stretch their dollars just a little more. On the other hand, assisted living facilities in the area are a bit more expensive than in other parts of the state. Palm Bay has hot, humid summers and cool-to-warm winters that aren’t very long. Average July high temperatures are about 91 degrees and average January lows are near 50 degrees. Summers often come with long stretches of daily thunderstorms. Florida is tax-friendly for seniors, imposing no income tax and no tax on social security benefits or pensions for residents, which means more money for bills or activities. With countless Orlando and Space Coast attractions a short day-trip away, a host of ongoing local senior activities and numerous opportunities to enjoy outdoor coastal living, Palm Bay is a perfect spot for active seniors to call home. Assisted Living costs in Palm Bay start around $2,826 per month on average, while the nationwide average cost of assisted living is $4,000 per month, according to the latest figures from Genworth’s Cost of Care Survey. It’s important to note that assisted living rates in Palm Bay and the surrounding suburbs can vary widely based on factors such as location, the level of care needed, apartment size and the types of amenities offered at each community. 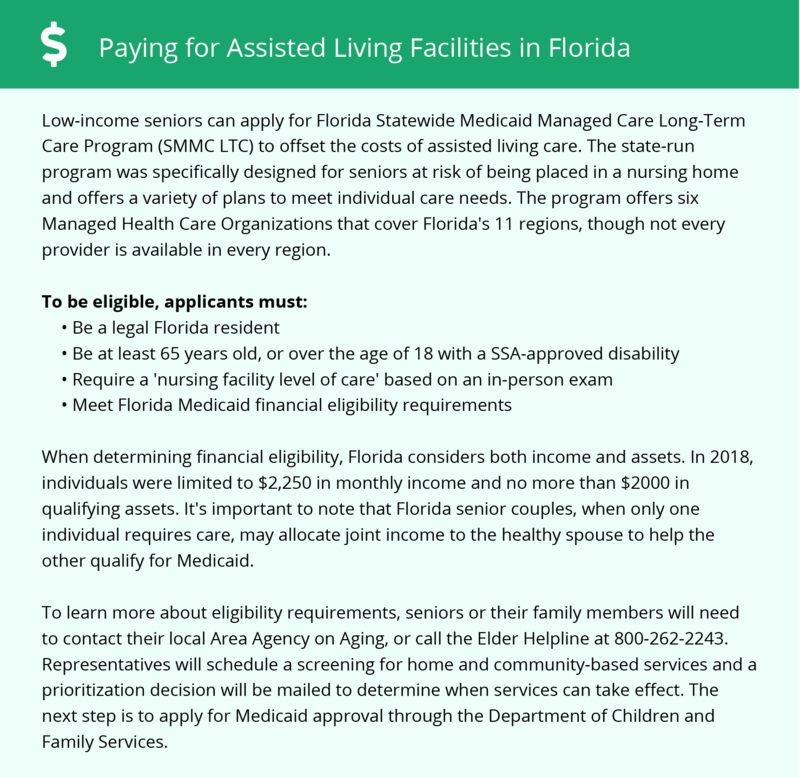 Florida can assist eligible seniors with the cost of services at assisted living facilities through two state programs: Managed Long-term Care (MLTC) and Assistive Care Services. Room and board fees aren’t covered or capped, but the plan provides rate negotiation for participants. Florida also offers optional state supplementation to seniors who receive Federal SSI benefits. Palm Bay and the surrounding area are home to numerous government agencies and non-profit organizations offering help for seniors searching for or currently residing in an assisted living community. These organizations can also provide assistance in a number of other eldercare services such as geriatric care management, elder law advice, estate planning, finding home care and health and wellness programs. To see a list of free assisted living resources in Palm Bay, please visit our Assisted Living in Florida page. Palm Bay-area assisted living communities must adhere to the comprehensive set of state laws and regulations that all assisted living communities in Florida are required to follow. Visit our Assisted Living in Florida page for more information about these laws.